If you are going through the old center of Berlin, that means especially the area around the famous boulevard Unter den Linden, you will see the whole street in a big mess. It`s looking like the fall of the wall happened yesterday, or the 2nd world war stopped a few years ago. Reason is, the city of Berlin is building a new subway line straight along this boulevard Unter den Linden, and it`s a pity for tourists, that in the moment, it is hardly to recognize, how beautiful this boulevard normally looks like. 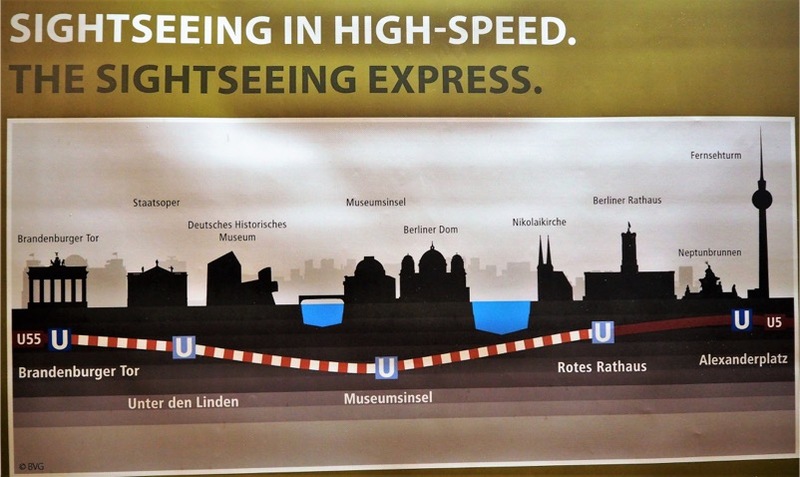 But it is necessary to build this new underground line number five, because there is a lack of connection between the new main station (Hauptbahnhof) and the station Alexanderplatz, the center of the city in the east. And there are several other reasons to build this new U-5 subway. First of all, Berlin is growing very fast in population every year. An estimated 60.000 people more are coming every year to Berlin. So the city itself should reach four million inhabitants in a few years. Second is the traffic on this wonderful boulevard. Estimated 15.000 cars are passing this street every day. Too many for a historic boulevard like this, where people want to sit outside in street cafes or slender around. 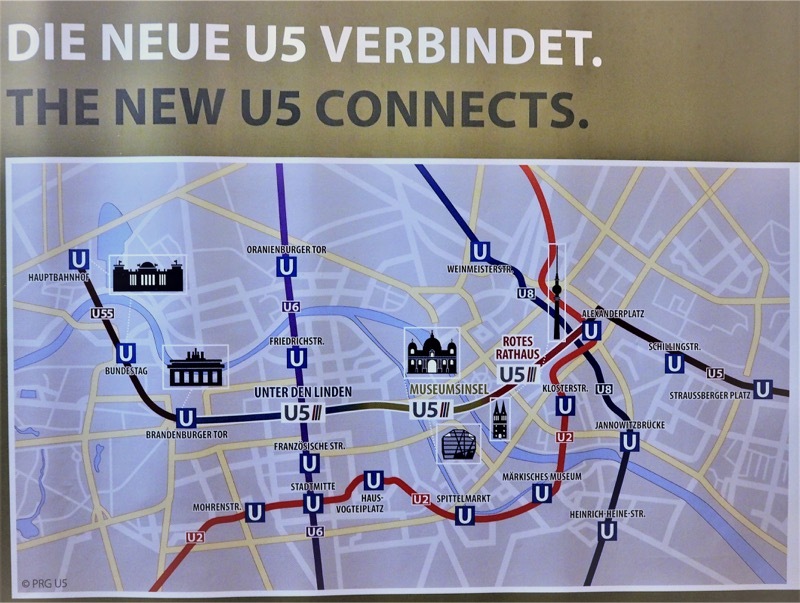 On this new line there are to find so famous landmarks like the Brandenburg Gate, the Museum Island and the Red City Hall, which all will get their own new stations. Others are along the way like the State Opera at the famous Bebel Platz and the time honored Humboldt University or the Berlin cathedral. 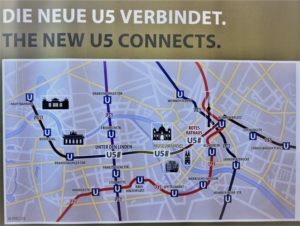 This is how the new U5 line will connect the sights between Hauptbahnhof and Alexanderplatz. When the new line will open in 2020, it will transport about 100.000-155.000 passengers a day. The cost for this project are around 525 million Euros and these costs are shared by the federal state and the state of Berlin. Berlin has one of the oldest subway systems in the world. The first line started in 1902 and the whole system grew very fast to its size of today of about 142,6 km and 173 stations. And with the new line between Brandenburg Gate and the Alexanderplatz 2,2 km more are coming to the net. And than more then 1.1 Billion passengers will be transported every year with the whole U-Bahn System.